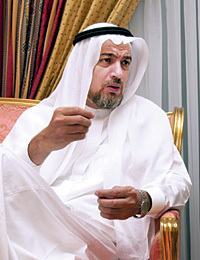 JEDDAH, 1 March 2004 — Lawyers for the prominent Saudi businessman and philanthropist, Yasin Al-Qadi, who has been listed by US authorities among individuals allegedly linked to the Al-Qaeda network, have revealed how a French investigator used the name of the United Nations to try to validate and promote a report falsely accusing the Saudis of financing terrorism. Al-Qadi also had his assets in several countries frozen. The investigator, Jean-Charles Brisard, wrote a report in 2002 entitled “Terrorism Financing: Routes and Trends of Saudi Terrorism Financing” which he claimed had been commissioned by the UN. The UN, however, denied any link to the report. Brisard stated that the report had been prepared for the President of the UN Security Council at that time, Ambassador Alfonso Valdivieso. The ambassador, however, said he had never met or spoken to Brisard. Al-Qadi’s London lawyers, Peter Carter-Ruck and Partners, said Brisard, an investigator for certain plaintiffs’ lawyers who filed a civil lawsuit on behalf of the families of victims of the Sept. 11 terrorist attack, stands to benefit from publishing the report and using the UN to give it credibility. Al-Qadi feels he has been subjected to a great injustice on the basis of flawed and grossly inaccurate accusations by the authorities in the US, the United Kingdom, Bosnia and Albania. He is nevertheless confident of his position, saying that he will be cleared now that almost 95 percent of the legal issues have been settled. Al-Qadi’s lawyers sent letters last month to the Security Council, the Senate Finance Committee and the American media, notably USA Today, saying Brisard’s claims are false. Arab News has been shown copies of the correspondence. The Senate Finance Committee referred to Brisard’s report in a letter it sent last year to the Office of Foreign Assets Control. The letter repeated the allegation that Al-Qadi was one of the “main individual Saudi sponsors of Al-Qaeda.” The lawyers wrote to the chairman of the committee and to the Senate minority leader that Brisard’s claim that the UN had commissioned his report was false and demanded that the incorrect reference to the report as an official UN report be corrected. Ambassador Valdivieso says he never met Brisard and that it was absolutely false that he had commissioned Brisard on a personal or official basis to write a report on terrorism. “Brisard has been asserting that in my capacity as president of the Security Council, I asked him to present a report on terrorism. I personally never met or spoke to Mr. Brisard, whose conduct and attitude have been deceitful and marked by the intention to mislead. He has used the name of the UN and also mine to try to validate and promote reports that very likely have little significant value,” Valdivieso said. According to Valdivieso, one of his assistants was approached by a man named Damien Peres. Peres mentioned Brisard in connection with a lawsuit that he — Peres — had handled on behalf of the families affected by Sept. 11 attacks. Peres volunteered to provide information on the financing of terrorism and in June 2002, Brisard came to New York and gave the ambassador’s assistant a report which supposedly has been submitted to the US Congress. Valdivieso said media reports then began circulating about a report “commissioned” by the Security Council or by the Council president. The UN has on several occasions confirmed that no such commission was issued and that Brisard’s claim was false. Al-Qadi’s lawyers also wrote to Karen Jurgensen, editor of USA Today, regarding a “highly defamatory” article by the paper’s foreign correspondent, Jack Kelly, entitled “Saudi Money Aiding Bin Laden.” The article, said the lawyers, contained untrue allegations and was based on discredited press reports. The report claimed that purported money transfers from a Saudi bank to Islamic charities, including Blessed Relief (Muwafaq Foundation), of which Al-Qadi is a founding trustee, were used to finance terrorist acts. Kelly was said to have repeated an allegation published by the London-based magazine Africa Confidential, claiming that an employee of Muwafaq had been arrested in connection with the 1995 attempt to assassinate Egyptian President Hosni Mubarak in Ethiopia. Muwafaq trustees initiated successful libel proceedings in the High Court in London and the magazine was instructed never to repeat the allegations, apologize to the trustees and pay substantial damages. The lawyers said Kelly made no attempt to contact the solicitors acting for the trustees who could have corrected many of the allegations before publication. They requested that an immediate investigation of this article be undertaken, that while the investigation was in progress the article be removed from the USA Today website and that upon completion of the investigation an appropriate correction be issued. The lawyers said they spent over two years studying the case. After going over thousands of documents and meeting scores of witnesses, they said they are convinced of Al-Qadi’s innocence. Al-Qadi said despite the great damage done to him personally, to his family and his business as a result of the American decision to freeze his assets, he understood the shock the Americans felt after Sept. 11 which led some officials to point accusing fingers at innocent people all over the world. “After more than two years of having my name listed among those suspected of financing terrorism, it is time that the authorities reconsider and end this stark injustice by immediately lifting the ban on my assets,” Al-Qadi said.